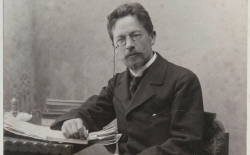 Throwback: Happy Birthday, Anton Chekhov! Every year, our High School Credit Session villagers take on a project to integrate everything they’ve learned about language, traditions, history, and art. Teams of villagers have worked together to solve environmental crises, to run political campaigns, and to retell Russian fairytales. The chance to dive into working with authentic materials, adapted for villagers’ familiarity with Russian, is part of what makes Lesnoe Ozero so special. Check out this Throwback to High School Credit villagers’ final projects from 2010, when they adapted Anton Chekhov’s work into short videos about Lesnoe Ozero!